i have started terrace organic gardening. my newly planted veg plant has some diseases. please let me know the remedy. 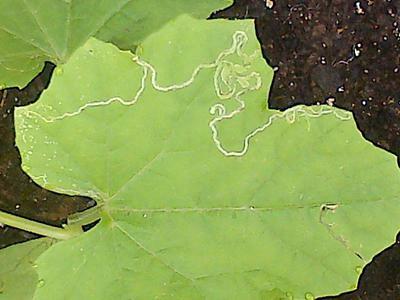 You have a pest called LEAF MINER. It burrows into the leaf and eats away. It's the lavae of a moth or little black fly (depending on which sort of leaf miner). A spray of insecticidal oil like neem oil, or make your own of a dash of dishwashing liquid, salad oil, some chilli powder and or garlic infused water. Best time to use this is when you can see the flies or moths. You can also rub your thumb and finger or finger nail carefully over the trails to squash the tiny caterpillars - they look like yellow specks at the end of each trail on the leaves. Another way to fix and prevent leafminers is to buy from your nearest plant center or from internet suppliers, some parasitic wasps called Diglyphus isaea, which will destroy leaf miners.